It was first published in 1879. It was the first of its kind, and to folks out on the Great Plains, it was a critically needed resource. And, today, it can be exceedingly useful not just to lawyers, but to genealogists as well. • Atlantic Reporter: CT, DE, D.C., ME, MD, NH, NJ, PA, RI, VT.
• North Eastern Reporter: IL, IN, MA, NY, OH. • North Western Reporter: IA, MI, MN, NE, ND, SD, WI. • Pacific Reporter: AK, AZ, CA, CO, HI, ID, KS, MT, NV, NM, OK, OR, UT, WA, WY. 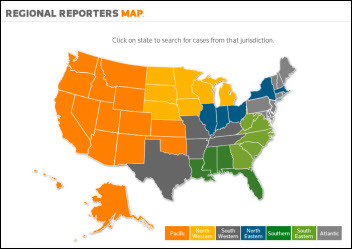 • South Eastern Reporter: GA, NC, SC, VA, WV. • Southern Reporter: AL, FL, LA, MS.
• South Western Reporter: AR, KY, MO, TN, TX. And the cases they publish can be goldmines for genealogical research. It tells the story of a young man named Vanderpoel who wanted to vote in the election of March, 1878. The issue was where his legal residence was. The key issue for the Court to decide was whether the young man could vote in the county where he was going to school or only in Mitchell County, where his permanent residence was. It ruled in favor of Mitchell County only. • An age of 19 in 1875. • Residence in Mitchell County. • A living father who paid school fees. • Sent to Iowa City to get an education. • Still there in 1878. • Age 22 and unmarried at the time. Pretty good info for a single paragraph in a three-page opinion, no? Check out the law books for any state where you have ancestors and see if maybe you have a budding litigator in your midst… or even someone who just played a bit role as a witness or juror in a case that got reported. Find them online at Google Books, Internet Archive and HathiTrust Digital Library… or maybe at the local law library of your choice. This just warms my law-librarian heart! We love to help people find information and this is a great example of the type of detail most wouldn’t expect to find in these records. Several years ago I found a court case on a Google name search – at that time all I could see was a single line but magically it had three surnames I recognized as family. All I knew was the source: Reports of cases determined in the Court of Chancery and in the Prerogative Court, and, on appeal, in the Court of Errors and Appeals of the state of New Jersey by George Blight Halsted; New Jersey. Court of Chancery. ; New Jersey. Prerogative Court. ; New Jersey. Court of Errors and Appeals. Sept Term 1847. Now it is on Google, then I discovered that it resided in two law libraries. One basically told me to get lost. At the other a wonderful clerk scanned and sent the entire 26 pages to me. He gave me my 4g Grandmother. Named her sisters and brother – I am still looking for the parents, but thanks to the alcoholic brother whose death caused the family to sue the man who was going to take his estate – I got more family – I am still looking for the parents….